Moore, Ward. Bring the Jubilee . Ballantine/Del Rey 1997. Moore, Ward. 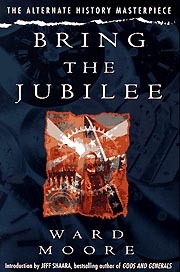 Bring the Jubilee . Cosmos 2009. Moore, Ward. Bring the Jubilee . Dover 2019. Moore, Ward. Bring the Jubilee . 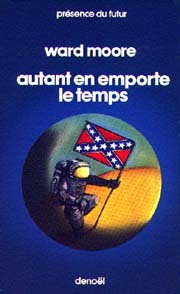 Translated to the French as Autant en emporte le temps , Denoël 1977. What if: Confederates occupied the Round Tops during the first day of Gettysburg, leading to victory in the battle and to Confederate independence. 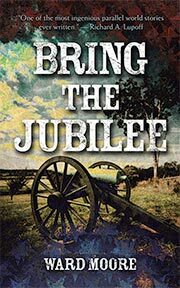 Summary: An historian in a fifth-rate 1952 US, overshadowed by the CSA and the Germanic Union, obtains a position at an academic commune near Gettysburg, and one day he is offered the chance to travel back in time to July 1, 1863. 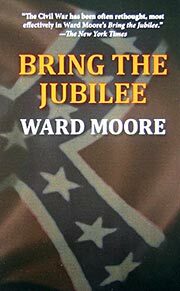 — Revision of "Bring the Jubilee", in The Magazine of Fantasy and Science Fiction , November 1952; The Fantastic Civil War (ed. Frank McSherry, Jr), Baen 1991 (0671720635); The Best Alternate History Stories of the 20th Century (eds. Harry Turtledove and Martin H. Greenberg), q.v. Sense of Wonder: A Century of Science Fiction (ed. Leigh Ronald Grossman), Wildside 2011 (1434430790BUY). Translation: Danish by Knud Müller as Det skete i skæbneåret , Nyt Dansk Forlag 1957. Translation: French by Jane Fillion as Autant en emporte le temps , Denoël 1977, 2000 (220725058X). Translation: German by Walter Brumm as Der große Süden , Heyne 1980, 2001 (3453179498). Translation: Italian by Beata Della Frattina as Anniversario Fatale , Mondadori 1956. Translation: Italian by Marzio Tosello as Anniversario Fatale , Mondadori 1986. Translation: Portuguese by Ana Paula Gouveia as E Tudo o Tempo Levou , Clássica 1992 (9725612019). Translation: Spanish by Cristina Macía as Lo que el tiempo se llevó , [[publ. unknown]] 1955; Martínez Roca 1989 (8427012845).